In the first of two close-ups from the British Research Barometer, we strip away the hype and look at the actual growth of new techniques and technologies. Our evidence points firmly to online communities as the one to watch, with mobile, social media, neuroscience and big data chasing. The 'BRB' was published last week for the first time by Circle Research and MrWeb - the full report is available free for download at www.circle-research.com/wp-content/uploads/2018/10/BRB-2018-report.pdf . Among half a dozen key areas of enquiry, we looked at the techniques changing research, with a particular emphasis on separating hype from reality, and found a stand-out leader in online communities. Here's why we think it's the biggest player in the near future, and which other technologies and new methods are growing fast. Looking at responses to the BRB itself, 88% of agencies say they've used online surveys in the last 12 months, says Circle's Chris Woolcott - far ahead of any other methodology. But change sometimes comes slowly in research. Looking at the chart below, based on the hype in the industry, you may think the data was five years out of date. Focus groups, in-depth interviews over the phone, in- depth interviews face to face - are they not being completely usurped by more modern and innovative techniques? According to the industry the answer is 'absolutely not', with over half using each over the past 12 months. If these aspects of the research industry are disappearing, they're clearly not in a hurry about it. However ubiquitous online surveys are now 'though, we have to remember that less than 10 years ago, CATI was by far the dominant form of quantitative research. Could there be anything on the horizon that will see the same explosion in use over the next 10 years? To delve into this, we crossed current usage with those expecting to use each methodology more often in the coming year. 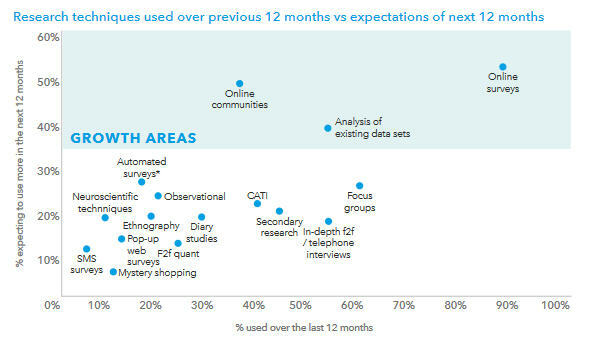 Here we see that online surveys are only set to continue growing in popularity (including a lot of access panels, contrary to the death knells being sounded by supporters of newer methodologies), and interestingly, we also see that the industry might already be catching on to the trend identified above when it comes to existing datasets - with their usage set to increase for many. One stand-out result is that online communities are expected to experience massive growth - despite only being used by around 1/3 currently. 78% of those using them currently expect to use them more in the coming year and 34% of those not using them expect to start. Both of these figures are higher than any other methodology that we asked about. Perhaps communities will begin to reach ubiquity in the area of mixed qual/quant research, in the same way that online surveys have in quant-only studies. True, online communities have been sparking interest for some time now, but there is plenty of evidence that they have already taken off and if anything are keeping up with the hype - something that can't quite be said of social media analysis, big data or neuroscience (see below). Appetite and expectation remains strong, and it will be interesting to track the progress of this over the coming year to see how fast it's becoming mainstream. MrWeb's Nick Thomas looked at this from another angle (we love multi-mode research). 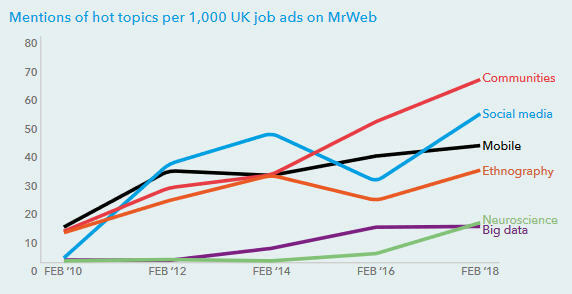 If DRNO articles give us a good picture of what's new and what's being shouted about, MrWeb job ad descriptions tell us which skills companies are actually willing to pay for, and therefore quite a good handle on what's actually being done. Online communities are of course the star performer here - the only one (just about) to show continuous growth and the comfortable leader in 2016 and 2018. With BRB stats pointing to the same thing, the smart money's on rapid development of these in the next couple of years. We'll publish a second close-up in a couple of days, looking at the client-agency relationship - but don't forget you can read the full report any time at www.circle-research.com/wp-content/uploads/2018/10/BRB-2018-report.pdf .